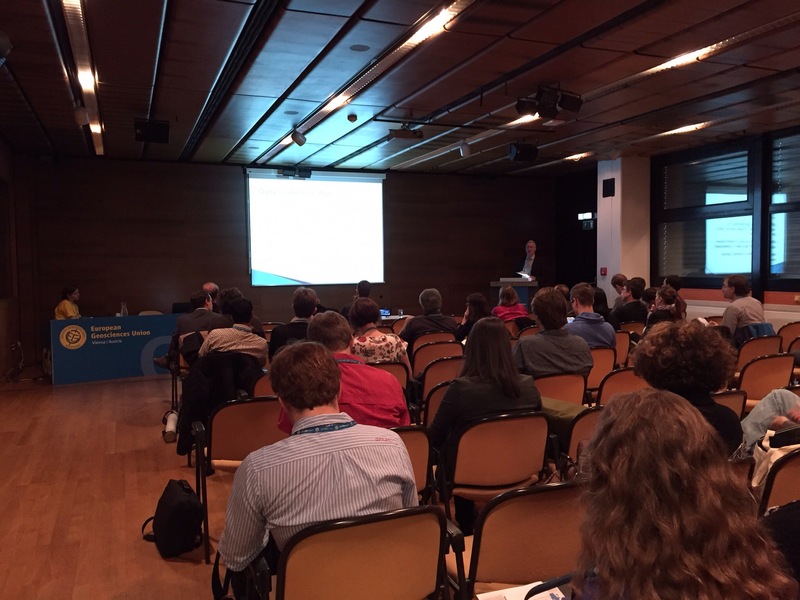 So the first day of EGU has come to a close and boy was it a cracker! I had a great mix of talks that were pertinent to my research and talks that I indulged myself by attending, particularly two that I had highlighted at the beginning of the week – PS4.1 Comets, Asteroids and Dust and PS4.2 Rosetta: first results from the prime mission. 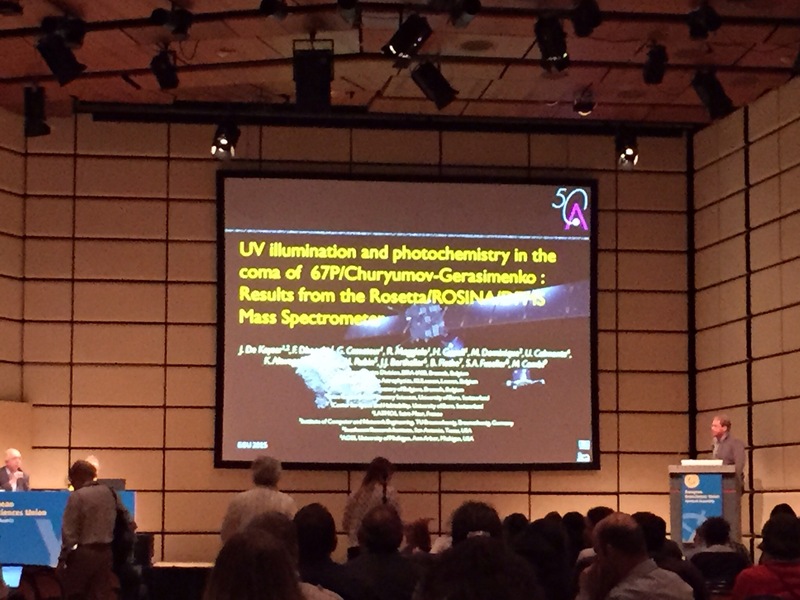 All in all I had a great day, and felt really glad to be back at EGU again! The first session I attended today was NH9.2 Forensic Disaster Analyses – Learning from Disasters. The session was mostly about flooding, but approached the challenge of learning through and from crisis situations in a a series of novel ways. 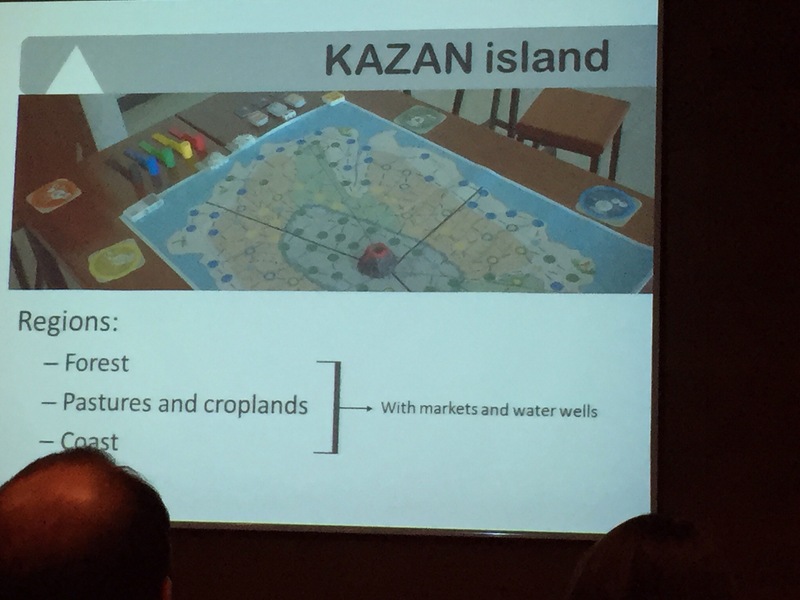 There was crowdsourcing flood data, post event adaption analysis using relocation and collecting and storing complete event data, with an eye to the needs of the end user. One surprising thing I learnt from this session was that the majority of flood damage occurs to infrastructure when water comes into contact with electrical equipment, and that this is rarely taken into account when planning mitigation. Interestingly the presentations felt to me that they addressed the societal element as one more data point, rather than engaging more fully with the issues and concerns of people affected by flooding, and I would have been interested to see how the subject was approached differently if a more holistic approach was taken. An interesting question that relates to this issue was the design of the crowdsourcing app to collect first hand data. One of the strengths of the app was presented that it gave residents control and engagement with the scientific process, and there was a lot of discussion about how you would get people to complete the data in the face of a crisis, but no-one addressed the question of whether people would voluntarily submit flooding data that may increase the cost of insurance in their area? Still at least the subject was being discussed, which is a positive move forward. 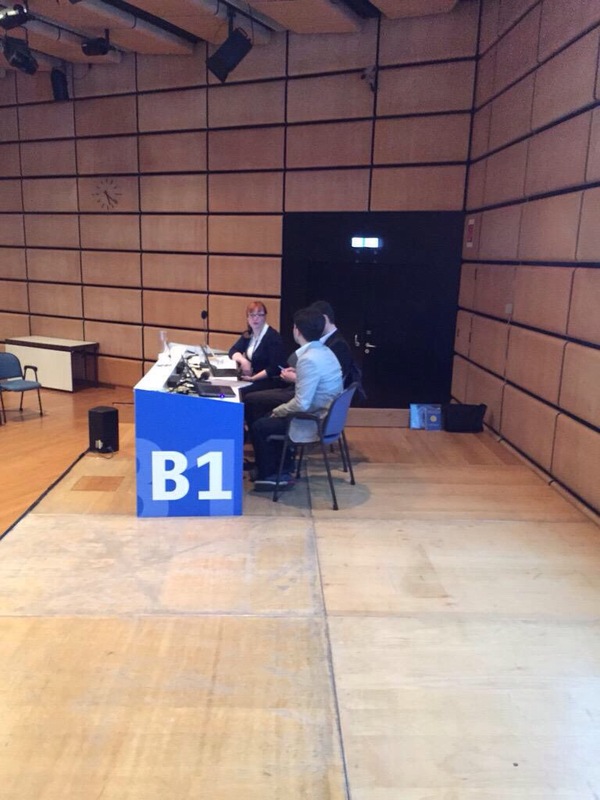 After a short coffee break I was on to my second session: PS4.1 Comets, Asteroids and Dust. This session was brilliant, often over my head, but filled with several interesting stories. My favourite was the presentation concerning the Student Dust Counter (not a new typ of student housing vacuum cleaner) – a spaceship designed, launched and maintained (including data analysis) by students. The spacecraft has been on it’s mission for 9 and a half years so far and is slowly approaching Pluto (right now it’s at Jupiter), it’s first target, before moving on to the Kuiper Belt. Most of the spaceship is dormant, but a few instruments are recording and transmitting data, riding along like barnacles on a whale! The best thing about this, and a question someone raised, is that this mission began over 9 years ago, which is well beyond the scope of a (European) student position – so how can it still be a student mission? Well the simple answer is that the mission, the data and the link to spacecraft are handed down, student to student, each old one training the new and so on, which I think is a brilliant science story – a whole generation of planetary scientists training each other to pass this little spaceship out beyond the furthest reaches of our solar system. The third session of the day was NH9.4/EOS19 Natural Hazard Education, Communications and Science-Policy-Practice Interface. 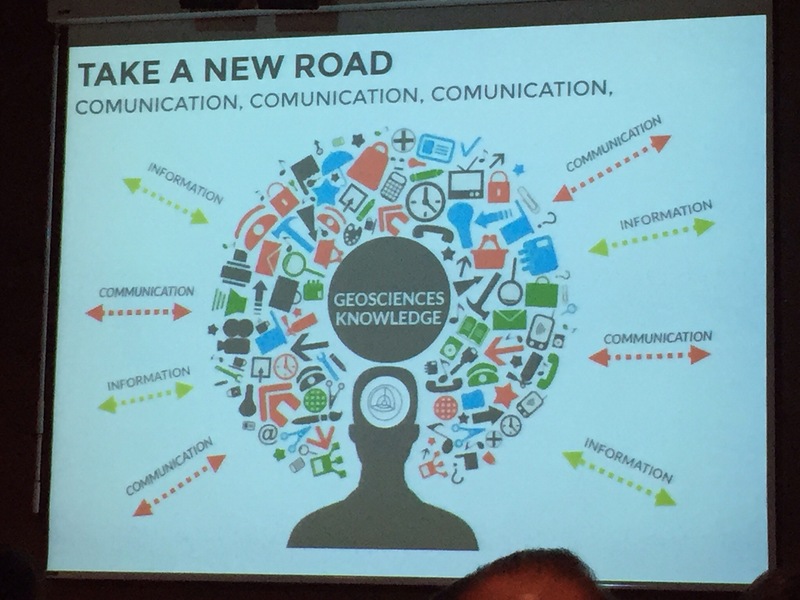 This was a brilliant session of both new ideas and lessons learned in science communication, from using board games to teach volcanic awareness, to encouraging students to design their own web app that would increase their understanding of geo-hydrological terms and how to use narratives to build the resilience of small businesses to flood events. There was also a presentation by a group os researchers from the CNR-IIA in Monterotonto and the University of Turin who were talking about the information deluge that you experience during a crisis and how people make sense of that deluge. They had designed a wiki to help with the provision of accurate and reliable data, but there were a couple of questions around the data. Clearly the idea was a great one, but the initial data had not been collected during a time of crisis, so all the conclusions were not related to the main crisis event, there was no knowledge of whether a crisis event changed the nature of people’s searches online. 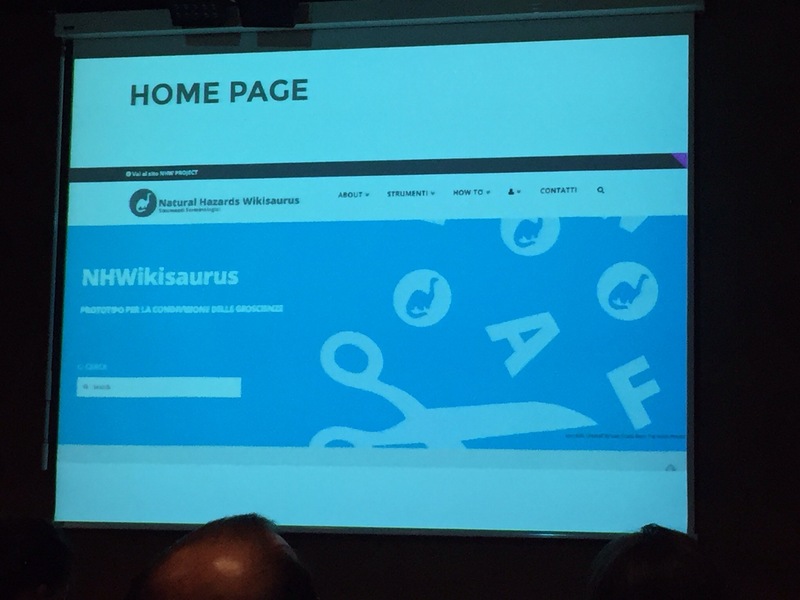 Also the wiki was called nhwikisaurus – which was a play on the thesaurus connectionn, but the icon was of a dinosaur, so this may be confusing for people who go there expecting it to be a dinosaur wiki. It was really good to see people trying to positively engage with risk communication in a new way. I then ducked quickly into the session on the initial results from the prime Rosetta mission and spent most of my time being absorbed by the gorgeous photos of the comet! I did find out though that Rosetta has a mass spectrometer on board and that they have a twin of the instrument in the lab in case of any issues! My last observational session of the day was SSS11.5/EMPR4.1/ERE2.5/NH4.4 Communication of uncertain information in earth sciences: data, models and visualisation. Now the informatics talks have somewhat put me off in the past as they seemed to revolve around finding statistical ways to represent uncertainty but the session today actually focussed on communicating that uncertainty. 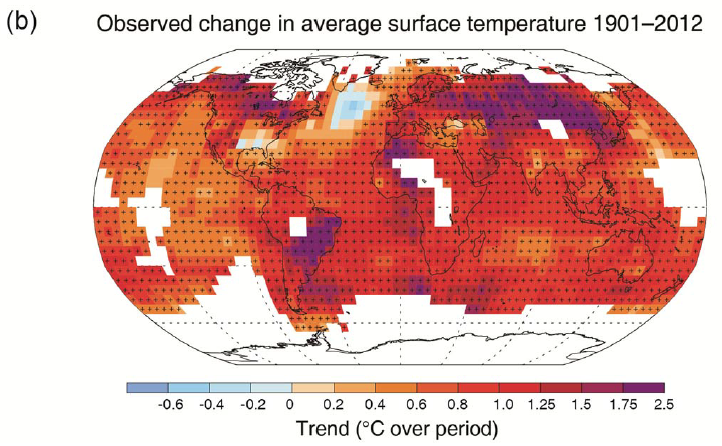 My favourite talk (that I was able to see -bit of an overlap) examined intuitive responses to IPCC diagrams and found that the colour schemes can often give false representations and that often the caption isn’t actually helpful in interpreting the image. The last thing I did today was to take part in a panel discussion: SC22 Open Science, Public Engagement and Outreach: why bother? I was joined on the panel by Ivo Grigorov from the Technical University of Denmark, and Ulrich Poschl from the Max Planck Institute for Chemistry, and chaired by Sam Illingworth, lecturer in science communication from Manchester Metropolitan University. To say I was intimidated would be an understatement, especially when Sam introduced Uli as ‘if not the father, then the kind uncle’ of the open science movement! But the discussion was lively and informal and by the end I had relaxed into it. The talk ranged across topics like what is open science, how to we make open access more avaliable, how do we deal with the issue of cost for open access (turns out that if all universities stopped paying subscriptions they could afford to get all papers published open access), why do we engage with the public, how to avoid or manage the ‘dinosaurs’ in your department who don’t approve of open science or public engagement, how to balance the ethos of open access with the realities of life as a young scientist and ‘Science 2.0’. It was a great evening and I thoroughly enjoyed myself and was left with lots of meaty issues to ponder – can we come up with our own metric of impact and how do you ensure that open science and engagement are not the last things on the list and the first to go in academic life? So all in all day 1 – I would say you’ve been fabulous. But what were your first impressions? And any tips for good sessions to drop in on the rest of the week? 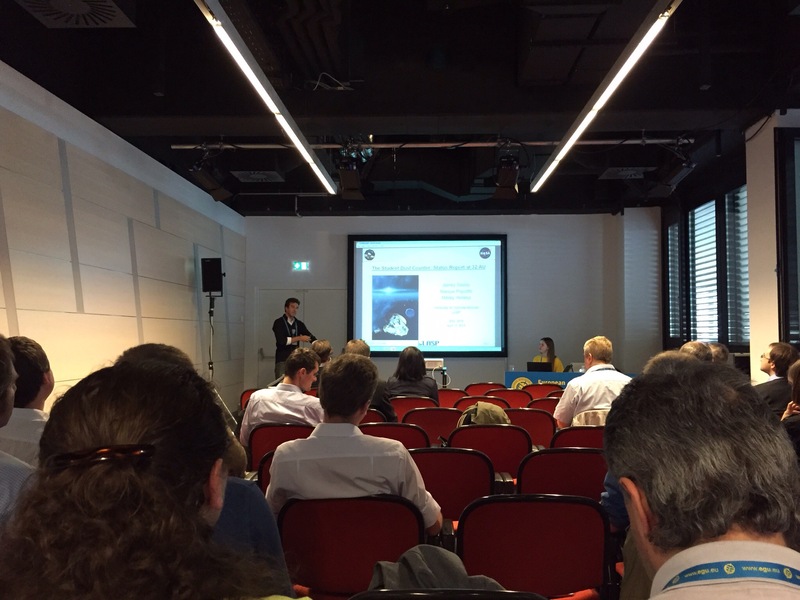 EGU 2015 – the excitement begins!